This past month we had a great combined meeting of the Silicon Valley JavaFX User Group (SvJugFx) together with the Silicon Valley Web User Group. The presenters included Richard Hyde and James Allen from Oracle on the Java Store and Yoav Landman and Fred Simon from JFrog on repository management with Artifactory. We were also fortunate enough to be contacted by the folks at Ubivent who have developed a JavaFX-based event platform. Their platform is used by large corporations like SAP, and they have generously offered to host our videos going forward. 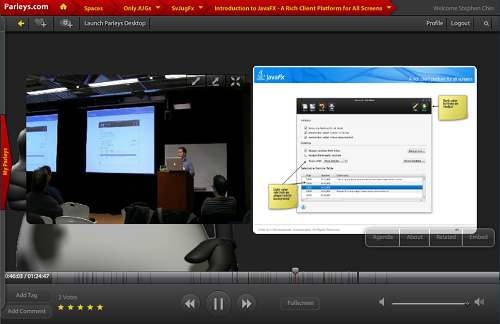 Therefore, you can now watch all the SvJugFx videos using JavaFX technology! Finally, when you click on a presentation you will be given a virtual theater experience with side-by-side slides and video. You can click on the double arrows to expand it to full screen, skip around by chapter, and comment on the video as you are watching. Also, we have posted the videos on our Parleys SvJugFx Space and will continue to do that for folks who like using this excellent presentation platform. I am very pleased to have Amy Fowler (Aim) presenting on JavaFX Layouts at our January Silicon Valley JavaFX Users Group (SvJugFx). 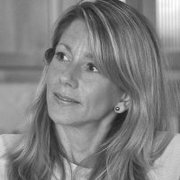 For those of you who don’t know Aim, she was a founding member of the Swing team, has done some Rock Star presentations at JavaOne, and is a core member of the JavaFX team focused on all things layout. We will also be streaming the event live from Santa Clara, so if you don’t live nearby make sure to join us online for the event. I actually think the folks watching it online are at an advantage, because they get all the inside information in the chat window from JavaFX luminaries like Jim Weaver, Dean Iverson, and Jonathan Giles. I hope to see you at our next event! 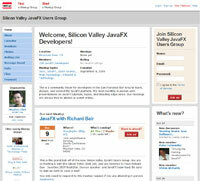 I am pleased to announce the formation of a new Silicon Valley JavaFX User Group. While this group is rooted in the SF Bay Area, we also plan to make it easy for remote attendees to watch and participate by doing live streaming of our meetings via USTREAM and allowing remote participation through Google Moderator. For the initial launch meeting on December 9th we are fortunate to have Richard Bair as the presenter. 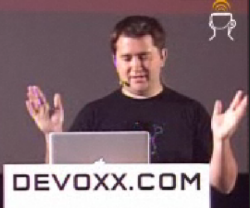 For those of you who don’t know him, he is a JavaFX lead developer, JavaOne Rockstar Speaker, has an awesome blog, and will be talking about JavaFX at Devoxx (where I am also presenting). He is also a great sparring partner on almost any technical topic (speaking from experience), so Q&A should be lots of fun! This is the first JavaFX User Group in the U.S. to my knowledge. Although Japan has the title of world’s first JavaFX User Group as reported on Jim Weaver’s blog.